Was it shot with a Go Pro? Yet another awesome video by the Backpack Prof! 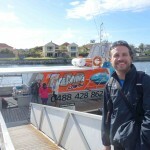 Great to see that you had a great day out with the Adventure Bay Charters Crew!!! Thanks for the awesome video!!! Amazing footage of your experience with the sea lions!! I also really liked your description of their playfulness! Well done!